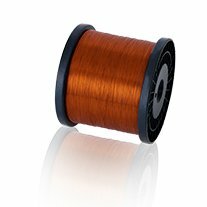 Normally enamelled copper conductors are used as coil components of various electrical products such as motors / transformers / home appliances / auto electrical components / chokes / AC compressors. Apart from AC compressors all other copper windings undergo secondary insulation coating and curing of the same. The process is called impregnation. The secondary insulation is used to get a firm compact winding, that can withstand vibration and all the copper conductors are held firmly together. The voids in coil are also filled by the secondary insulation. It also prevents direct contact of moisture with the primary (enamel) insulation film. The basic property of secondary insulation (varnish) is to hold the winding together. However for certain applications (where the secondary insulation is not practical) self-bonding enamelled wires can be used. These wires have an outer layer of bondable material which is usually thermoplastic and bonds the wires surfaces with each other once heated to the bonding temperature of the outer layer. Bondable wires, thus, benefits in reduction of cycle time and elimination of process of secondary insulation application / baking / curing cycle etc. Bondable wires can be used in power tools armature coils, electronics, miniature coils, TV yoke coils, continuous-transposed conductors etc. The bondable layer is applied over variety of primary insulation like polyester, polyester-imide, dual coated and solderable polyurethanes of class 130, 155 and 180.